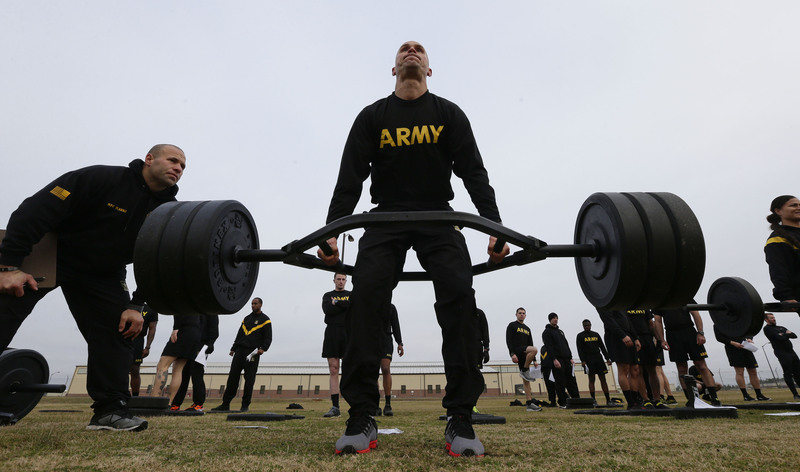 The U.S. Army is developing a new, more grueling and complex fitness exam that adds dead lifts, power throws and other exercises designed to make soldiers more fit and ready for combat. Commanders have complained in recent years that the soldiers they get out of basic training aren't fit enough. Nearly half of the commanders surveyed last year said new troops coming into their units could not meet the physical demands of combat. Many senior officials think that the existing fitness test does not adequately measure the physical qualities needed for the battlefield. The new test, "may be harder, but it is necessary," said Gen. Stephen Townsend, head of U.S. Army Training and Doctrine Command. Reaching the new fitness levels will be challenging. The old fitness test graded soldiers differently based on age and gender. The new one will be far more physically demanding and will not adjust the passing scores for older or female soldiers. For example, in the current test — two minutes of situps, two minutes of pushups, a two-mile run — younger soldiers must do more repetitions and run faster to pass and get maximum scores than those who are older or female. While not adjusted for age or gender, the scoring will be divided into three levels that require soldiers with more physically demanding jobs, such as infantry or armor, to score higher. Across the country, 63 battalions are working on the final test development and will eventually go back to their units and train others. By October 1 this year, the entire Army will be using the test. By October 2020, it will be the official exam that all soldiers will have to pass. Hmm, not that bad of an idea. In the picture he's only deadlifting 315. I've done 360 before. Personally i think this is a good thing, world war 3 could happen any second because kim jung un has been being really sketchy lately. Great idea. After all, we can't have wimps in the US Army, now can we? cool! Im glad they are getting very strong but those exercises are very intense!! Good one, Phillip G. And I agree with Grant G. because I've seen some pretty wimpy army soldiers, and you guys haven't seen Air Force soldiers. They don't require as much training as Army, Marines, or Navy Seals. Yeah, and my Dad is in the Air Force, but he's not as wimpy. However, he doesn't just get wimpy guys at his station, he also gets lazy ones who complain too much. Most of the time he'll get good ones who are working to support their family. anyone know who wrote this article? Yeah, you do have to be strong ZACK!! It seems like you would also have to be very strong emotionally, because you don't want soldiers having nervous break downs on the battle front!! I'm sure it helps if you are strong, but not all positions in the army require strength. My uncle is also in the army and he's a really high rank (I don't remember which one though). You have to be strong to be in the army unless your a paperwork person. No offense to anyone. That's just my opinion. Excuse me, WHAT. If a woman wants to serve in the army, she shouldn't be restricted. This isn't the 19th century, I'm disappointed that people with your opinion still exist. I disagree with most far left feminists, but the fact that some people still don't think women should have basic rights like this is honestly depressing. I don't see why not? I have been interested in the navy, and they let women in. Or what are your reasons for saying that women shouldn't be in the army? I think women know what there getting into. If a woman wants to joun the Army then she must be aware of what they do for training, right. Okay so there are some things that women can"t do as good as men, but that doesn't mean that they shouldn't be allowed to do what they want. Plus if a women makes it through all that hard training than she definitely deserves to be in the Army. I think that if a woman wants to be in the Army she can. If she can get through training why do you care? I would like to be a plane pilot for the army. I want to join the armed forces or the police or something along those lines. if I had to pick I would choose to be in the CIA. And I think women should be allowed to do anything men can. I mean, the only differences between us aren't that big. Thank you, I don't think eneyone has agreed with me before. I mean in riten form. You know like wrightig: @Nadia A I agry . Spelling coretion AGREE not. Agry. Mabey they agreed in there head? I do that a lot.